Steven A. Silnutzer, P.C. - contact - Steven A. Silnutzer, P.C. 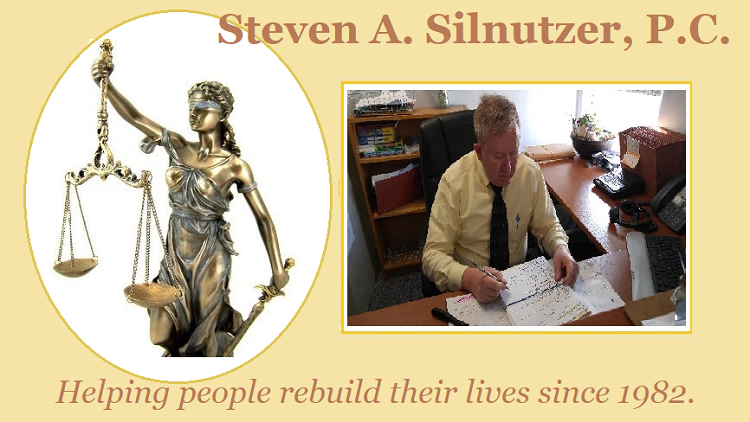 About Steven A. Silnutzer, P.C. Evening & Weekend Hours available by appointment. Complete the form below to submit your request for more information. We look forward to providing you with the answers you need to decide how you will go forward. The information contained in this website is provided for informational purposes only. It should not be construed as legal advice on any subject matter. No one should act or refrain from acting on the basis of any content included in the site without seeking the appropriate legal or other professional advice on the particular facts and circumstances at issue from a licensed attorney. The content of this website contains general information and may not reflect current legal developments and verdicts or settlements. Every individual case may have facts and circumstances that will differ from other cases, so your situation should be reviewed by an experienced attorney. Any information provided on this website is not intended to create a lawyer-client relationship.